Thus, perhaps we shouldn’t have been shocked when the kids and I happened to have an up-close-and-personal encounter with the Queen just last week, while we were visiting the National Museum. My son (who I affectionally refer to as the Best Boy Ever, because he’s an awfully good boy) has been studying the Vikings and was hoping to see the Viking artifacts. When we asked a museum worker to point us in the right direction, she informed us that this section of the museum was temporarily closed, due to a visit from the Queen. With her 75th birthday just a few days away, the museum had invited her over to view a new portrait it had recently hung in one of its galleries. The BBE was wiling to wait to see the Viking rune stones and coins. His younger sister (who has the slightly less complimentary nickname of Mafia Princess…trust me, she earned it!) 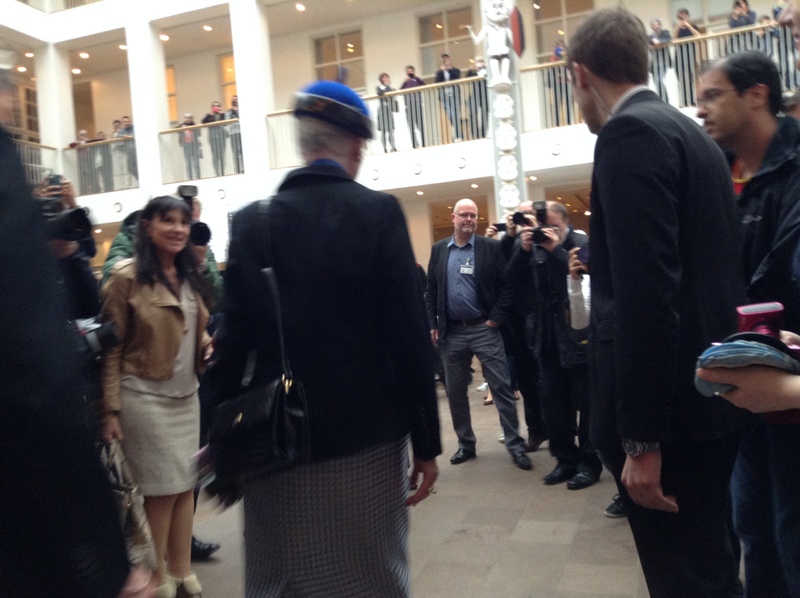 is obsessed with all things royal, so she was delighted to stick around to get a glimpse of a real queen. We stood on the stairs to get a good view as she strolled through the museum into the gallery, and then we waited for 15-20 minutes while she observed her portrait and several other items in the room. Through the glass walls, I have to say she looked genuinely interested in what the museum curators were telling her. The BBE was probably close enough to reach out and touch Her Royal Majesty, which was pretty cool, regardless of whether or not you’re a fan of royalty. I am sure some of the men in dark suits must have been security personnel, but her retinue seemed quite reasonable and there was a relatively small fuss made about her presence, all things considered. 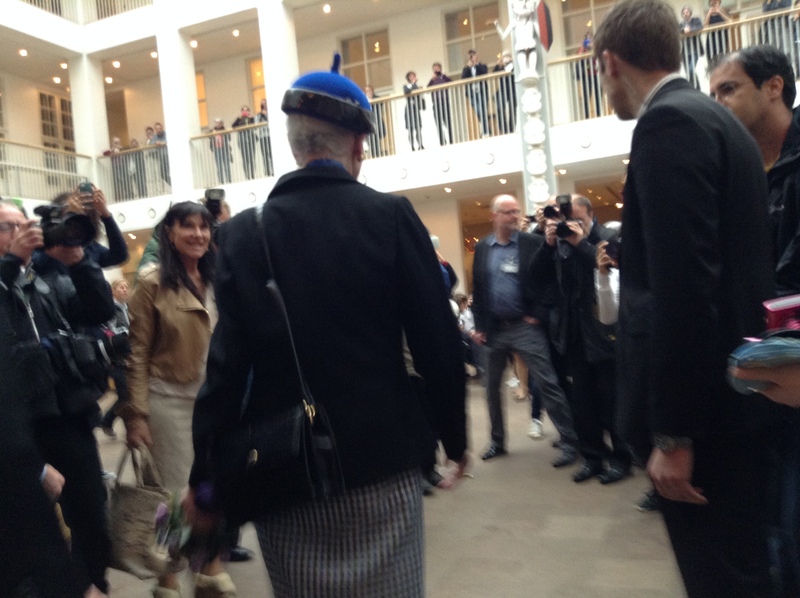 As for Margrethe, she managed to pull off regal and unassuming at the same time. I wonder if that trick has taken some years of practice. 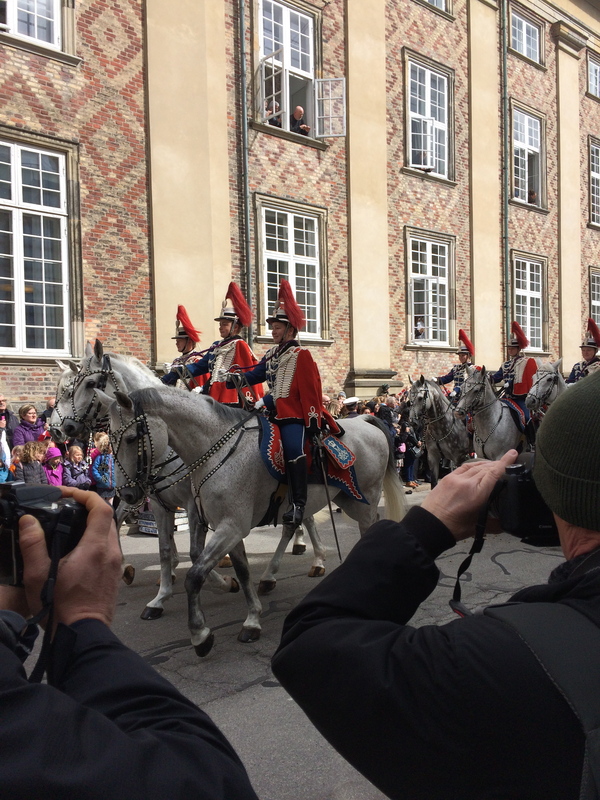 There was considerably more fanfare at our second royal encounter of the week, when we walked down to the area surrounding Amalienborg Palace for the official birthday festivities. Rather than brave the packed courtyard to see a faraway view of the royal family waving from the balcony, we decided to stake out a spot along the Queen’s carriage route to City Hall. We found a few feet of open space along Fredericiagade, and settled in for a 30-minute wait. 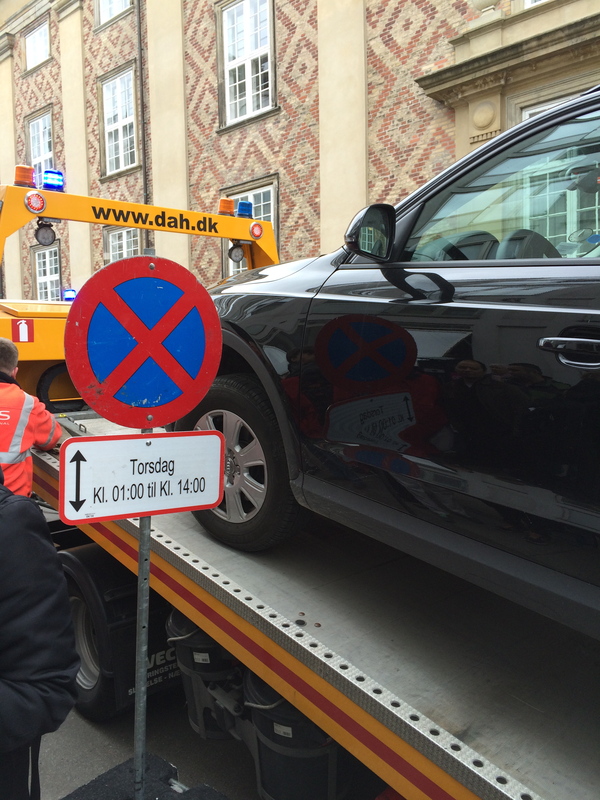 Happily, we were treated to an unexpected pre-show when a tow truck pulled up to remove an illegally parked Audi Q3. The BBE was completely fascinated (he actually called this the high point of his entire day! 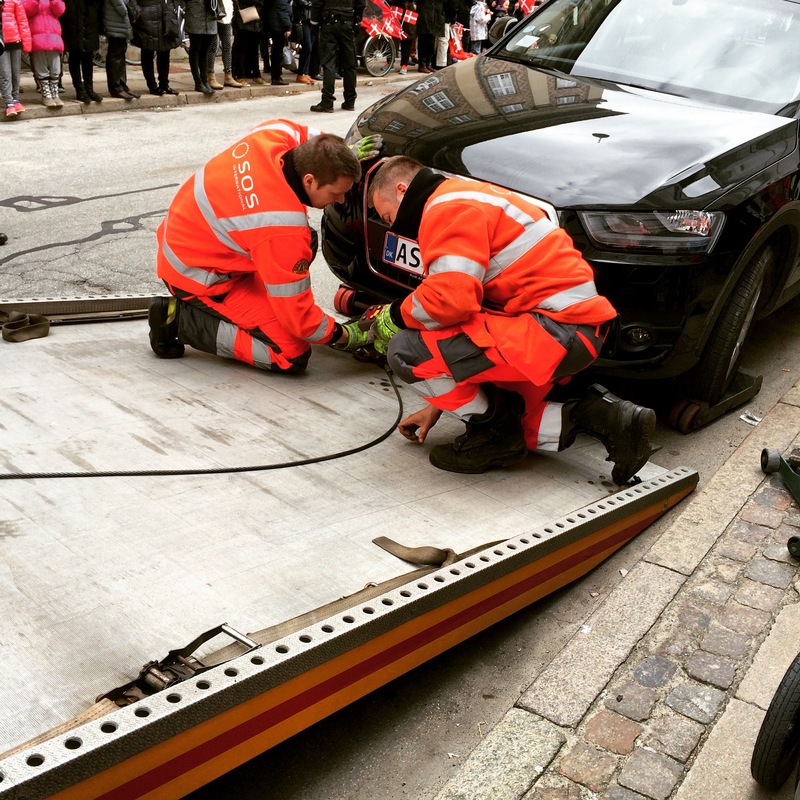 ), and even I was interested to see how much effort it takes to tow a car. The orange-suited crew worked on it for about 25 minutes, cutting it quite close and eliciting a round of applause when the car finally made it onto the truck. As you can see below, the signs made it pretty clear that no parking was allowed on this street that day. I’m sure the Audi’s owner had an unpleasant surprise when they next went to drive their car. With the street clear, it was time for the royal procession to begin. A long line of mounted royal guards provided bookends for the Queen’s open carriage. She was accompanied by Crown Prince Frederik and his wife, Crown Princess Mary (from Tasmania). The Queen, again, looked genuinely pleased to be taking a carriage ride through the streets of her lovely city. 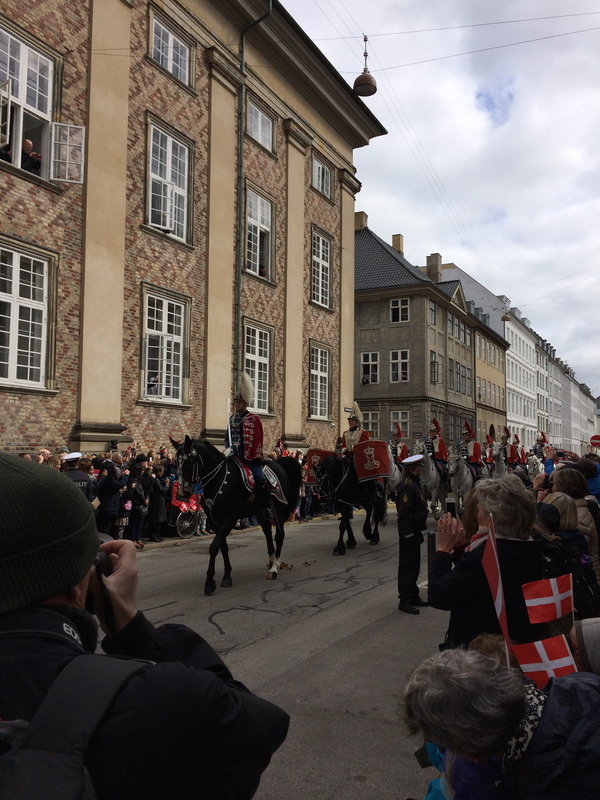 In true Danish form, her route was lined with Danish children waving their small red and white flags, and the crowds were admirably reserved as their monarch passed by. The Danes often refer to Dronning Margrethe as simply “Daisy”, and you sort of get the impression that they feel very affectionate towards her but aren’t unduly wowed. Maybe that “regal yet unassuming” trick has worked on the whole country? Once the procession ended, the BBE was most interested in the quantity of manure left by the horses and wanted details about how and when it would be cleaned from the street. The MP enjoyed seeing the Queen but was primarily interested in what we would be eating for lunch and how soon. All in all, it was a successful week of royal encounters here in the fairytale Kingdom of Denmark. ← Velkommen tilbage til Danmark (i.e., Welcome back)!